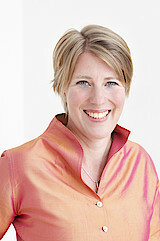 Isabella Bauer is an expert in conflict transformation, mediation and violence prevention. In her work, she focuses on local dynamics in peace processes and post-war peacebuilding, on conflict-sensitive approaches to refugee work and on violence prevention in the public health sector. Isabella Bauer graduated in Social Work and Pedagogics (Diplom FH Potsdam) and holds a Master’s degree in Peace and Security Studies (IFSH University of Hamburg). Since 2002, Isabella Bauer has worked for various organizations in the field of intercultural management, conflict transformation, mediation and peace education. She lived and worked in different conflict regions (South Africa, Uganda, Kenia, Israel and Nepal) for more than five years. In Germany, she has trained personnel for civil missions and worked in the field of peace education with international partners e.g. in Iran and East Timor. Since 2015, Isabella Bauer has been working as a freelance trainer, consultant and mediator. She is based Cologne. She started to work with BICC in 2010 on diaspora groups in Germany and resumed the cooperation in 2016 in the project on Forced Displacement: Research and Transfer.